The International Khalsa Council held it’s bi-annual meeting in Espanola, New Mexico on April 19th -22nd 2017. 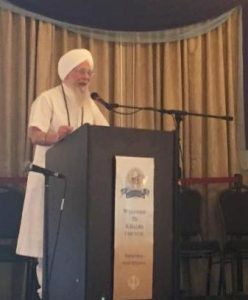 Khalsa Council meetings provide a forum for Ministers and leaders of the global Sikh Dharma community, to join together to discuss issues of relevance and importance to our Dharma, both in the present and for the future, and to serve as an advisory council to the legacy organizations founded by the Siri Singh Sahib. These meetings were very dynamic, informative and uplifting. Since then, there has been continuing dialogue and action steps on many of the topics that were addressed. The following are some highlights of the meetings, including updates on work that has continued since the meeting. 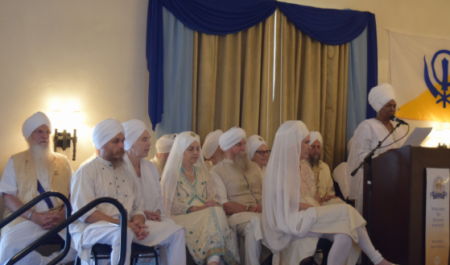 The Opening Ceremony was held in the Hacienda de Guru Ram Das Gurdwara, beginning with beautiful Kirtan of 31 minutes of chanting Dhan Dhan Ram Das Guru. The Secretary General, SS Gurujot Kaur welcomed everyone, and saropas were presented to the new members of the Khalsa Council. 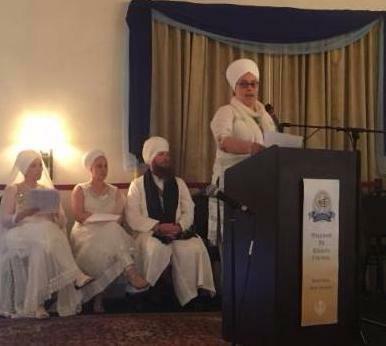 She spoke about our participation in the historic 350th Anniversary celebration of the birth of Guru Gobind Singh that took place in Patna Sahib in January. Approximately 100 members of our Sangat joined with hundreds of thousands of Sikhs from around the world, to represent the legacy of the Siri Singh Sahib and Sikh Dharma International. After the Gurdwara, lungar was served to the ashram community. SS Gurujot Kaur, Secretary General of Sikh Dharma International, welcomed and thanked the members for their continued leadership and vision for our growing global community. The theme of these meetings is “Conscious Khalsa Leadership for the Future”. 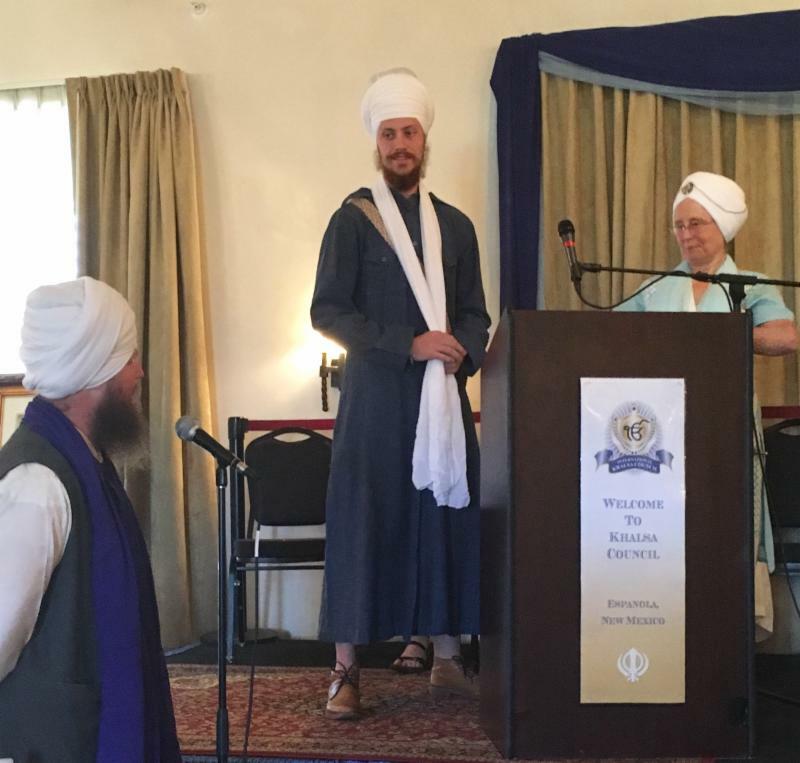 She noted the shift as more millennials are serving as members of the Khalsa Council and are stepping into their role as leaders of our Dharma. Working together across the generations, we can move forward in building the future of our Dharma. She spoke of the opportunities for our community to serve during these challenging political times. 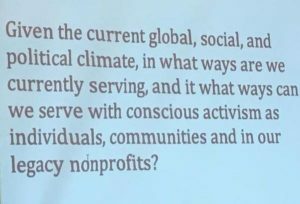 We will discuss and address how as individuals, communities, and as non-profit organizations we can use our dharmic teachings and yogic technology to serve and effect positive change. The Siri Singh Sahib said we are the “Council of Tomorrow.” Individually, we can make a difference, but together, we can move mountains! 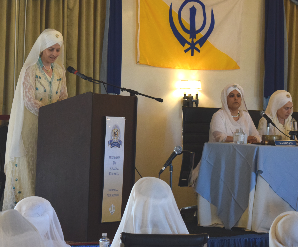 Siri Sikdar Sahiba Sardarni Guru Amrit Kaur, spoke about how we can take a spiritual perspective on what is happening in the world. It is all a gift from God so how can we stay in a state of consciousness that God is the Doer? Sometimes a crisis needs to happen to wake us up to do our work. We can see centuries of change and turmoil and attempts by religions to address the issues of how to bring about harmony in the face of human conflict. As Sikhs, we carry the Guru with us to bring the Light into darkness and help transform it. Through Guru’s Shabad we can become a lighthouse. Khalsa contains that purity. The key during times of great strife is to find a way to be empathetic and compassionate. It is a difficult gulf to bridge. Letting devotion lead us, guide us and assist us. The Siri Singh Sahib came to create leaders for the shift of this age. Guru Gobind Singh came to remove tyranny and protect the Dharma. Both achieved and were authentic to who they were. Likewise, we need to find our way that is high enough and wide enough in scope to hold what we must deliver. 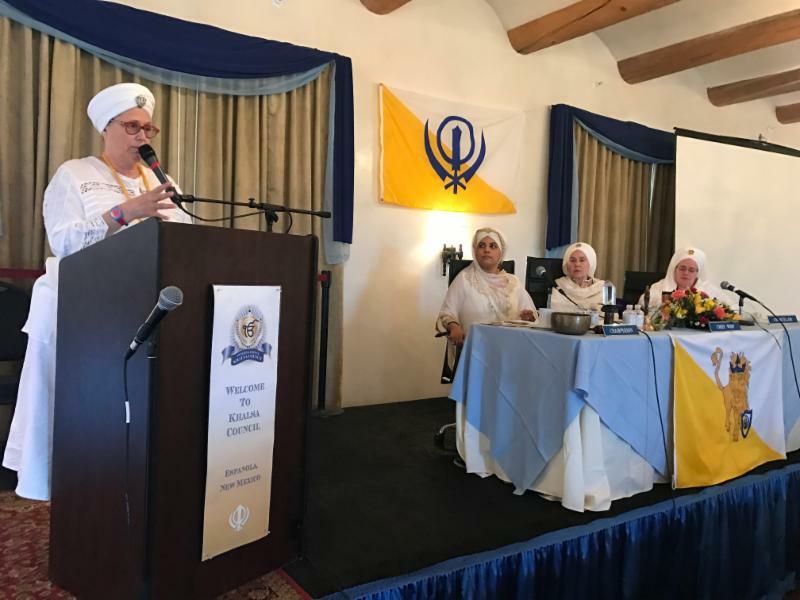 SS Dr Harjot Kaur, Chairperson of the Khalsa Council, addressed the Khalsa Council saying that being a part of the Khalsa Council is a Seva. ‘This is a leadership body and a place to dialogue with compassion, and discuss and debate the crucial issues of the times we now face. We must stay relevant and current. We are in very challenging times. We are now in a world where we are seeing opposing spectrums clashing openly. Hate, racism and bullying are being encouraged. The fundamentals of the Khalsa-equality, Seva, social justice, defense of the innocent and vulnerable-these are the qualities the world needs and the qualities we have a unique ability to offer as an organization. How can we make the world a better place? What triggers us to stand strong as steel, steady as stone? We need to understand our history and understand how we can activate our values in action. “When things are down and darkest, that’s when we stand tallest.” We can model consciously the virtues of Khalsa consciousness. Through our thoughts and actions, we play an integral part in shaping our world. We can respect differences of opinion and inspire conscious action. We are the Khalsa. Let us vibrate it and stand strong as steel, steady as stone, mind and soul, breath and bone. SS Shanti Kaur explained that activism is taking action to effect social change. Our Sikh history is full of activism, of standing for righteousness, freedom and social justice. There is a changing landscape and it’s important that we are educated so we can help others. Hate crimes are on the rise and there is a growing level of intolerance. She invited representatives from our non-profits to share how they are addressing these issues. SS Ek Ong Kaar Kaur from Sikhnet shared that SikhNet reached out to other Sikh organizations after the initial Muslim travel ban and hosted weekly calls so all the organizations could interface about their issues off concern, and any actions they were taking. The main concerns were about discrimination agains Sikhs, Gurdwara safety, questions about immigrants seeking sanctuary in Sikh Gurdwaras and creating positive visibility for Sikhs. MSS Nirvair Singh from KRI shared that KRI is working to highlight the value of inclusion and how they can make our teaching materials and training more inclusive to serve underserved communities around the world..
SS Pritpal Kaur from 3HO – 3HO started a 40-day meditation on inauguration day creating a unified prayer to create change. They feature models on their site who represent all races and gender orientation and they are working with members of the LGBTQ community to recognize their needs. Pritpal Kaur shared that it is most important to give people hope and inner strength to go through challenges. 3HO’s intention this year was to make Peace Prayer Day a truly interfaith event. Guru Sangat Singh from Sikh Dharma of Virginia shared that In the Herndon, VA Gurdwara they are actively supporting individuals with immigration issues, writing letters to courts and attending trials and hearings to show community support, helping individuals find jobs and housing, disseminating know-your-rights information in the Gurdwara in both English and Punjabi, and developing lists of attorneys and non-profit immigrant aid organizations. In collaboration with other Gurdwaras, they have in writing, condemned all hate crimes. 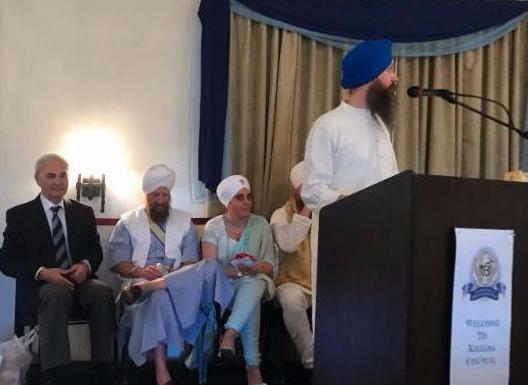 Guru Sangat Singh suggested participating in interfaith organizations, holding vigils and panel discussions, sponsoring Seva projects, and developing relationships with elected officials and law enforcement. Siri Chand Kaur spoke about what the Espanola community is doing. They formed an action group which is reaching out to the broader Espanola community. 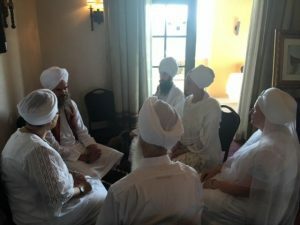 The Khalsa Council then broke into small discussion groups to discuss the following question: Given the current social and political climate, as a dharmic, conscious community, what is our unique way of serving humanity at the current time: as individuals, as communities around the world, and as non-profit organizations. 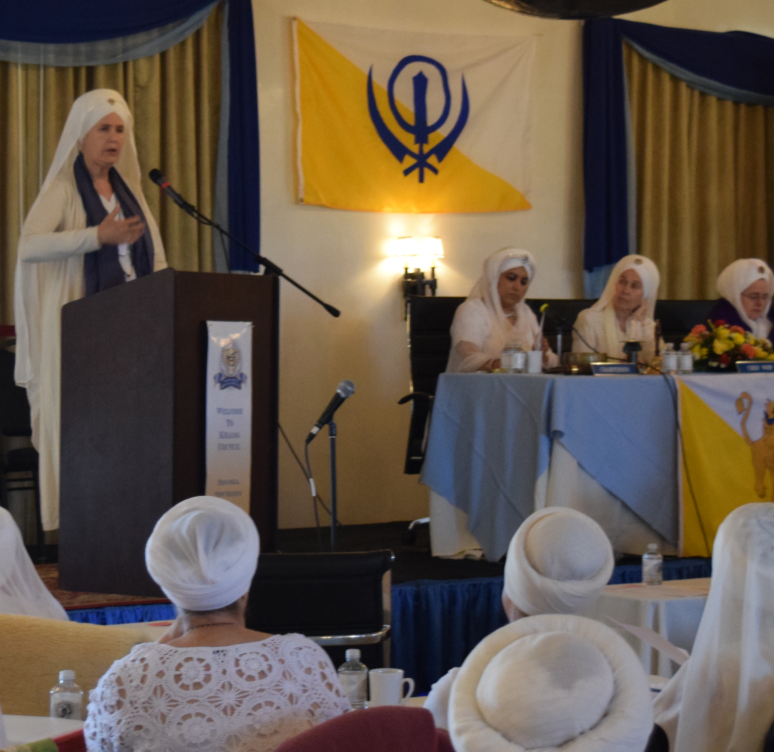 SS Shanti Kaur shared the mission of the OPA to affirmatively influence public opinion and expand awareness about the Legacy Organizations of the Siri Singh Sahib, build and maintain a positive reputation for our organizations, and build solid relationships with the Indian Sangat, the yoga community, media, and the general public. She described the formation of the office, including staffing, funding and organization. Dr Harjot Kaur and SS Shanti Kaur gave a presentation sharing that Sikhism is a world religion and can be found everywhere, yet professional polls in the US show that 60 percent of people don’t know about Sikhs or have never met a one. Shanti Kaur says, ‘It’s time to change that and deliver a consistent message about who we are and what we stand for.’ She emphasized how important it is to talk to people in person and find ways to present to groups. We need to get out there more and talk. A handout with talking points was given out. Dr. Harjot Kaur spoke on speaking about Sikhism in public and at interfaith gatherings, stating that people often have stereotypes or misconceptions,so be sure to explain our values and concepts clearly and simply and find common ground. It’s important for us to know Sikh history. You can offer to do a Sikh prayer at interfaith events. Be active, speak and share the wisdom of Guru Nanak. 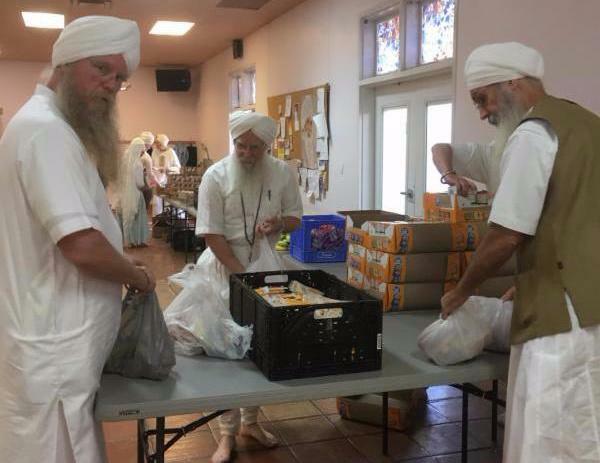 After the first day of the meetings adjourned for the day, we moved to the Langar Hall to pack bags for Guru Simran Kaur’s Food 4 Kids program. More than 400 bags were packed to be taken to students who may otherwise have no food over the weekend. What a wonderful opportunity to serve together as the Khalsa Council! For more information on the wonderful work done by Guru Simran Kaur and her crew of volunteers, see the video below. 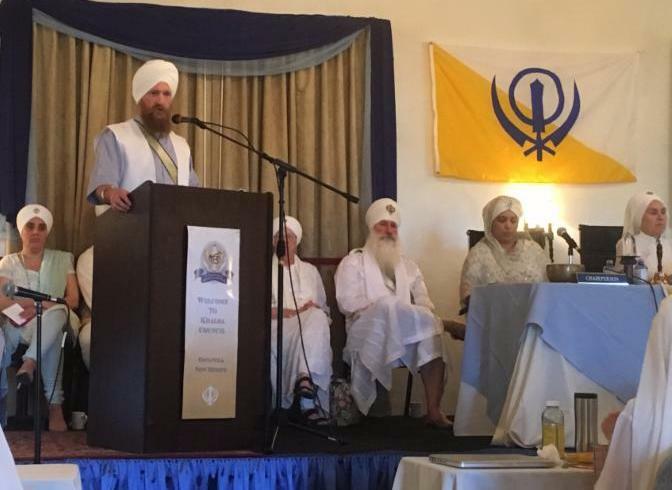 At each meeting of the Khalsa Council, the Siri Singh Sahib Corporation gives an update to the Sangat on the activities and work of the SSSC. The entire Sangat is invited for the presentation, which is followed by a Q&A session. He reported on the Patna Sahib Yatra and on a new property management structure and working toward a collaborative structure between all the Dharmic businesses. He is excited by the growth of the Dharma, stating, ‘This is the path of the soldier/saint. It is about how we interact and face challenges. SSSC board is a group of soldier saints. We have to stay strong and keep up through every obstacle.’ He encouraged young people to consider becoming Ministers. He noted the tremendous dedication and hard work of the SSSC board. SS Satwant Singh, Executive Director, presented a slideshow about the accomplishments of the board over the past seven months. He noted a resolution passed by the SSSC board to require Khalsa Council review and approval of all SSSC board agendas. 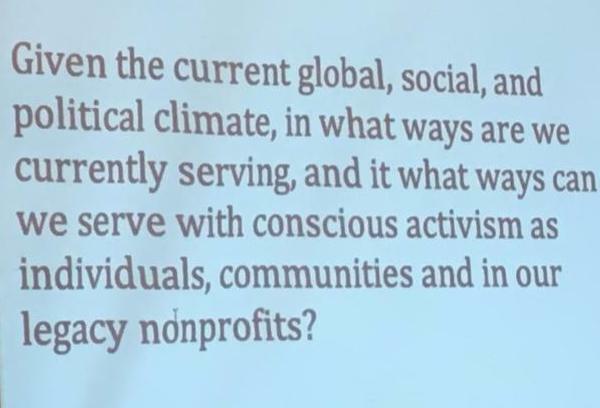 He shared about ongoing projects and discussion topics, including a shared service project addressing the needs of an aging Dharmic population. He shared about new staff for the Executive team and welcomed Amrit Vela Kaur Khalsa from Chile. He reviewed the SSSC board election process. 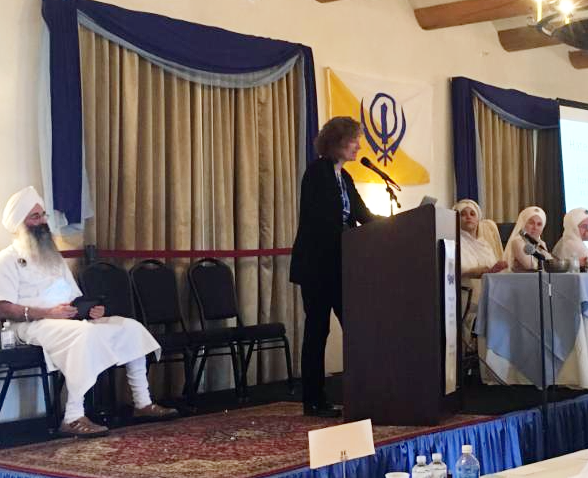 Atma Kaur, Assistant to the Executive Director, addressed the Khalsa Council about her role and vision for the board. Sat Mandir Singh, KIIT Board Chair, introduced the speakers representing the for-profit businesses and honored SS Seva Kaur for her four years of service on the KIIT board. Sat Bachan Kaur, EWTC Board Chair, shared about the board composition and honored SS Sat Sundri Kaur for her service to the board as Executive Director. Sat Bir Singh, Conrad Myers, East West Tea Company, reported on accomplishments since ownership restoration, as well as the return of some employees. He shared how they are serving the global community by giving back, and presented a slideshow of Seva Projects they are involved with, particularly within their grower communities. 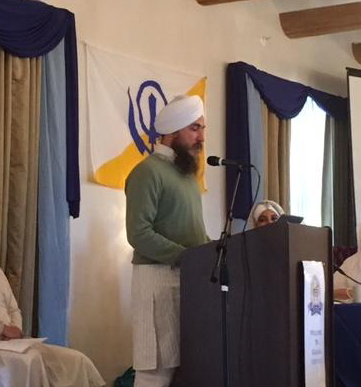 Krishan Shiva Singh, Acting Chair of the Akal Security Board, gave a report on Akal Security. He emphasized that prayers are needed to help Akal Security during some difficult times. He reviewed the history of transition from 2014 – 2017 and shared what has taken place since February 2017 to address an urgent situation. There is a positive outlook, based on some significant changes, including a close alignment between Akal and the Akal Board and the KIIT Board. He reported on near term objectives, especially returning Dharmic values and principles to the business. He shared about his experience playing the 25th Pauri to support what was needed to turn the situation around. He outlined the key contracts and services of the three companies that are part of the Akal group. Sukhwinder Singh, KRE, shared on the progress, profitability and positive environmental impact of KIIT Renewable Energy, which started 18 months ago. She asked for a show of hands of who would support a Global Seva Initiative to be co-sponsored by our non-profits and asked members to hand in suggestions for Seva Programs. SS Gurujot Kaur told the Khalsa Council that the intention of this global initiative is to provide members with tools to create their own seva programs in their communities. She shared a video about Ravi Singh in Los Angeles, Share a Meal Food Program for the homeless. Amrit Vela Kaur shared about the Langar Chile program, which regularly serves meals to homeless people and also serves during disasters. It has grown into a large program throughout Chile that is funded by donations. 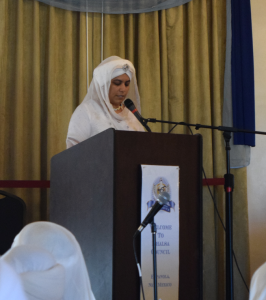 SS Guru Simran Kaur shared about the creation of the Espanola Food 4 Kids program, which she started as a seva project during the Journey Into the Heart of Sikh Dharma course. She shared details about how she runs the program which feeds about 500 children on a weekly basis, so that people can take her experience and duplicate it in their own town. age, geography, and gender representation. The survey was created with input from the Khalsa Council Executive Committee and sent to the eleven for- profit and non-profit boards. Guruprakash Kaur spoke of expanding the SSSC election process, which was to be reduced to include solely Ministers in good standing. Since the meeting it was decided that the electorate for the upcoming SSSC elections, would remain as they were for the last election and include Khalsa Council members as well as Ministers. The formation of a Defining the Electorate Task Force was announced to take place before the September meetings. Sat Bir Singh presented on his numerous activities on behalf of yoga research and Yoga Therapy. He is a proponent of creating a consortium of yoga organizations to provide leadership in the areas of yoga research and promotion. He proposed that we support a development office to seek funding for yoga service initiatives and research, and show up as leaders in the yoga community and devote public affairs funding to promoting our efforts. Sat Bir Singh presented on his extensive work in Yoga Research and Yoga Therapy and he emphasized the need to be proud of the research showing that this is real biology and we are changing lives. He urged the Office of Public Affairs to publicize to the world that we have scientific trials that show the effectiveness of yogic technology for Alzheimer’s and other illnesses and that there are studies done by Kundalini yogis showing the benefits of yoga for youth. Sat Bir Singh stressed that we need a development office to take advantage of people who would like to donate to the development and promotion of yoga. He shared that, ‘Research is for validation purposes of what we already know and allows us to request funding for programs that serve under-served populations. ‘You have to show safety, efficacy and economic benefit and research suggests that we should mainstream yoga into Public Schools, workplaces and hospitals. There are already a number of programs happening that we could support in order to bring yoga to the world. Guruprakash Kaur spoke as a parent and as a former India student and MPA staff member. She is grateful to the school and the SDEI board for their transparency and their efforts at remediation. She felt very upset at the thought that we might not be able to continue the school in Amritsar. For a fraction of the cost of moving the school, we can have a sustained future of MPA in India. 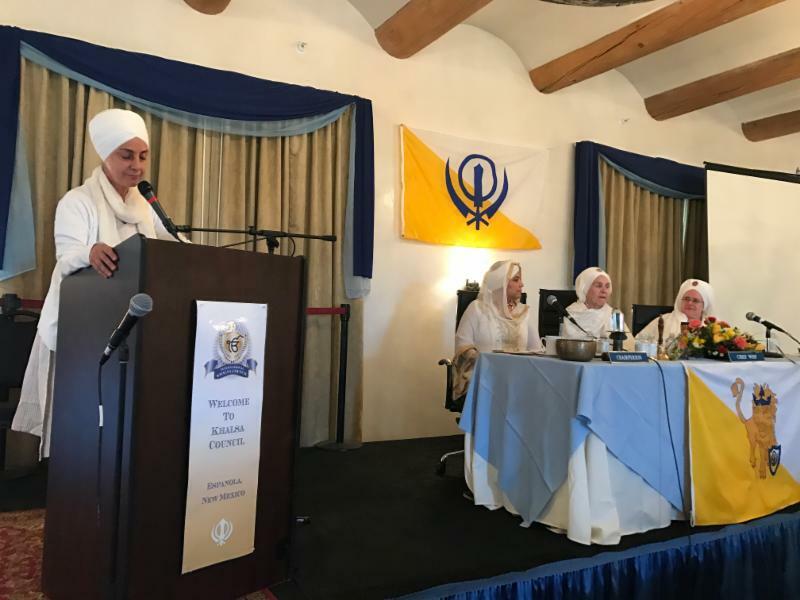 She encourages our leadership and the Khalsa Council and the SDEI board to come together to figure out a way to have our children raised in the most wonderful environment. Guru Sadhana Kaur also feels relief knowing that her children will have an opportunity to attend MPA. She is relying on MPA to be there for her children. She hopes the leadership recognizes the essential need for this school and finds a solution. SS Simran Singh, Chair of the MPA Alumni Association reported on the new mentorship program, pairing MPA students with alumni mentors. There are 500 proud graduates. They gained three corporate sponsorships to help students fill positions and serve as global ambassadors, and help with fund programs. Sat Nam Fest just made its fee free to all MPA graduates. The Association is also creating a photo archive. The MPA Alumni Organization also organized an alumni/student art show in Santa Fe from June 6-26, 2017 celebrating spirituality. They have 18 donors to their organization from the Khalsa Council. Viriam Singh invited all members to join the LGBTQIA Task Force. The group serves at the request of the Khalsa Council and meets once a month via GotoMeeting and maintains minutes. 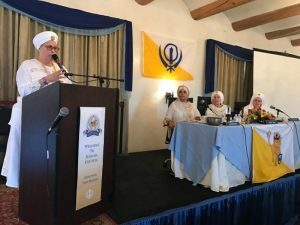 The Task Force has set safety standards for communicating about these issues and Viriam said he is learning to be an ally and to stand up for another group, which is part of our Sikh history. That is our calling as Khalsa.The group plans to present an orientation to LGBGQI needs at the next meeting, to know how to respond to the different needs of this diverse population. SS Jot Singh introduced Suki Halavi, Regional Director of the New Mexico Anti-Defamation League. Suki Halavi shared about the purpose of the ADL and spoke about the paradox of keeping a house of worship sacred and welcoming while maintaining security. She believes that the discussion should not be about fear but about awareness and preparedness. She noted the positive outcome of working in coalition with other groups such as the Sikh Coalition and SALDEF and how In 2017, the US Senate made a resolution defining hate crimes and how they need to be handled. She encourages reviewing Gurdwara and community security. Consider installing a buzzer at the gate or a guard at the door. Suki Havali encouraged Khalsa Council members to host or attend community-building events with local organizations and work with local law enforcement to make security suggestions, organize a local hate crimes task force and form a coalition. 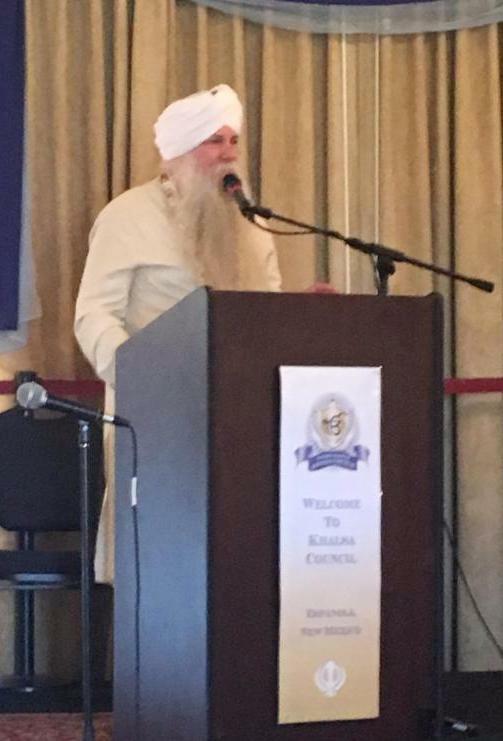 SS Jot Singh reviewed some key information from his previous presentation to the Khalsa Council about security and protection for communities and event stating that it is important to do security reviews and have a security plan for all events and gurdwaras. SS Arjan Kaur and Arjan Singh gave a short slide presentation about the history of the Mexican sangat and the birth of 3HO in Mexico. They were the first Sikh couple to be married in Anand Karaj (by the Siri Singh Sahib). They host the largest White Tantric course outside the United States and have over 1,500 certified KRI teachers. They teach prisoners to lead yoga classes in prison. 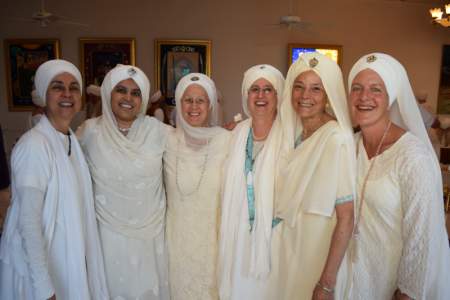 They have overcome many challenges to continue to spread the teachings of Sikh Dharma and Kundalini Yoga. SS Sat Hari Singh spoke about the creation of the European Khalsa Network because of the dearth of Sikh Dharma Ministers to participate in the European Khalsa Council. He created it to gather, inspire and train people to become Khalsa and eventually to be Ministers. 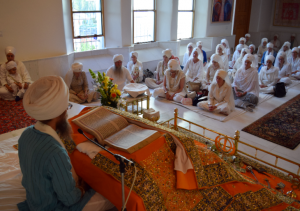 People were invited to the Guru Ram Das Aquarian Academy in Germany on Baisakhi and SS Sat Kirin was invited to teach. Over 50 people attended this inaugural and inspirational event. SS Sat Kirin Kaur shared that people felt at home in the Gurdwara, making Prashad and reading an Akhand Paath. The children were participating and leading Song of the Khalsa with Celestial Communication. She added that people are also moving to this small town in order to create a Sikh Dharma community. 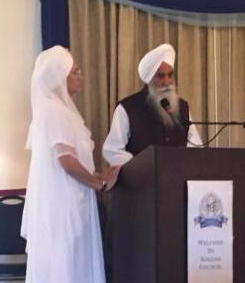 SS Guru Sangat Kaur gave a report on the Sangat in Brazil. She shared about a program to cleanse corruption in the political and business arenas and noted that there is a program for teaching yoga to the Brazilian Supreme Court and in the police department. 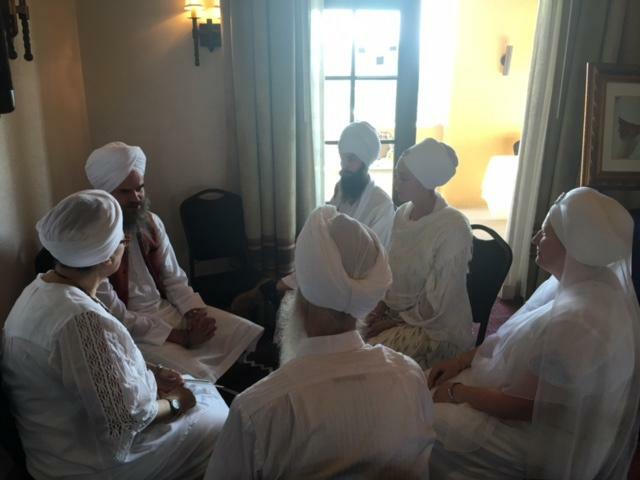 There was a “panj” of several Kundalini Yogis and a Sikh Dharma Minister, approved by the Supreme Court to help “decompress” the stress of what is going on in the country. She asked for prayers for Brazil in their efforts to get rid of corruption. She also shared that more Miri Piri schools have been opened around Brazil. The goal is to spread the Sikh Dharma teachings through the schools. All are welcome to visit. SS Guruka Kaur presented on the progress being made on the SDI code of ethics and development of the complaint resolution process for SDI. 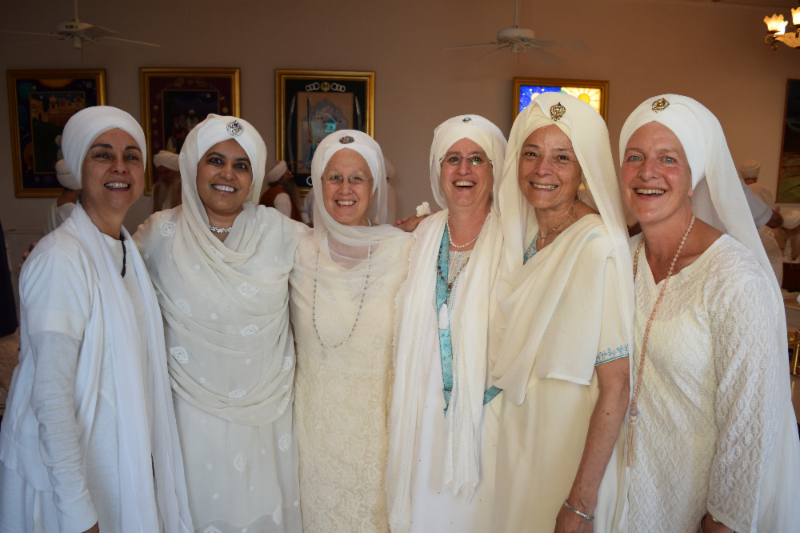 Guruka Kaur works on an international level to share about the relationship of students and teachers and recently traveled to help build relationships in South America (Columbia, Peru, Paraguay) and South Africa. She stated, ‘We need to find ways to really bring people in, especially those who are not normally able to access our classes and Look at having more yoga teachers from different backgrounds.’ She has learned many lessons and spoke of the power of looking more deeply at diversity. 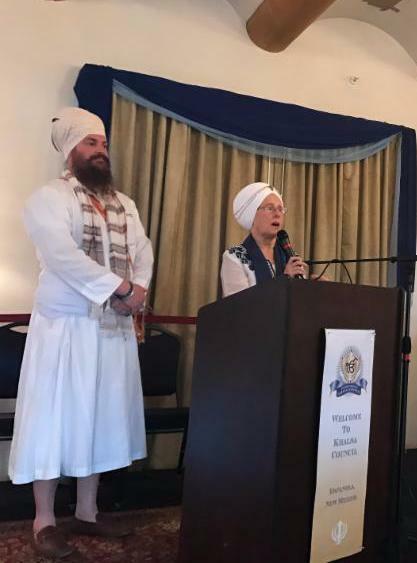 SS Guru Fateh Kaur and Ram Krishan Singh shared that our Espanola 3HO Sikh Dharma community is featured in an exhibit at the New Mexico History Museum called Counter-Culture: Communes and Consciousness in the Southwest. The exhibit features photos from the 1970s and artifacts belonging to the Siri Singh Sahib. The exhibit opened in May 2017 and runs through March 2018 and the museum is selling Yogi Tea and KRI books in the gift shop. Our New Mexico Sikh community was invited to host a Day on the Santa Fe Plaza and we celebrated our community with Yoga, Kirtan, Bhangra, booths for the non-profits and Turban Tying. The event was a huge success and brought a day of high vibration fun to the center of Santa Fe.